In the sixth week of his twentieth century formal analysis class, he arrived breathless over the previous night’s performance of Barber’s Hermit Songs. The class hooted. A stunned Els appealed to the professor. Sure-fire Christmas gift for the composer in your life. 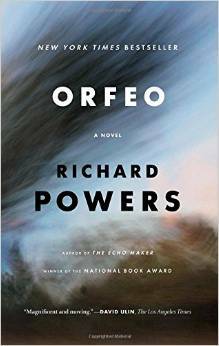 Yeah, Orfeo’s a good book. When it’s my turn to pick a book for the book club Carol & I are in. I think Powers describes a way that musicians listen to music which will be useful & ear-opening for a mostly civilian audience. A lot of the other people in book club studied visual art in college, so they’ll have some other echoes in the general academic setting, too. & I’ll probably make a compilation recording of the works performed in the book, too. As to the biological thread of the story, a Canadian poet, Christian Bök, has made a work that seems close to the encoding created in the novel. Bök, has a pair of texts that he encoded into the DNA of a bacteria, using combinations of proteins as a kind of cipher (so the protein string AGT stands for one letter in English, CAC stands for another). When a bacteria encoded with the first ciphered text in its DNA string undergoes a particular natural process, the order of the proteins changes to represent the other ciphered text. Haven’t read this one yet but his use of musical references was particularly touching and effective in “The Time of Our Singing”, a beautiful multigenerational fable. I’m generally suspicious of historical fiction but this one works particularly well for me. There are layers of metaphor in his musical references that are enhance the story if you know a little music history. I’m glad you liked it, Kyle. You might also want to check out two other Powers novels – The Gold Bug Variations and, especially, The Time of Our Singing. Powers also captures the “feel” of Champaign Urbana perfectly. I was extremely impressed with the book too. I would certainly welcome more music in literature. Here are a few favorites, for your amusement: the pianocktail, that mixes drinks to match what you play (Boris Vian’s “L’écume des jours”), the song that Bruno sings sitting on the dead mouse (Lewis Carroll’s “Sylvie and Bruno”), the chorus that Watt hears in the ditch (Samuel Beckett’s “Watt”), and the performances in Raymond Roussel’s “Impressions d’Afrique”: the zither-playing worm, the man who sings solo rounds, the quadruple amputee one-man band, the tibia flute. We need more! Yes, an incredible book – I just quoted it in a comment on your Concord Sonata thread! And I’m with Elaine, he totally nails Champaign-Urbana.